– Discovery: Nothosaurus is the best known member of the nothosaur family and its discovery in 1834 by German paleontologist G. von Munster led to the creation of the nothosauroid order. A number of fossils have been discovered throughout Europe, North Africa and even in China. A number of Nothosaurus specimens have been named but the initial discovery was recovered from the Germanic Muschelkalk, a sequence of sedimentary rock strata that stretches throughout central and western Europe. A fully complete Nothosaurus skeleton can be found in the Natural History Museum in Berlin Germany (see picture above). – Description: Nothosaurus was one of the longest surviving of the nothosaurs, roaming the Triassic coastline for around 30 million years. It was also one of the largest, growing to lengths of around four metres. It had a distinctively long skull with lengthy jaws that were equipped with sharp interlocking, needle-like teeth. Even though Nothosaurus could snap its jaws with incredible force, the muscles used for opening its mouth were very weak, meaning it would have hunted small prey items. The majority of its diet would have most likely consisted of fish but it is believed that it would have also tackled small or juvenile marine reptiles. Nothosaurus did not have flippers, instead it had short legs with webbed feet which would have been used to propel the animal through the water when swimming. These feet combined with a streamlined, powerful body and a lengthy eel-like tail would have made it a fantastic swimmer. 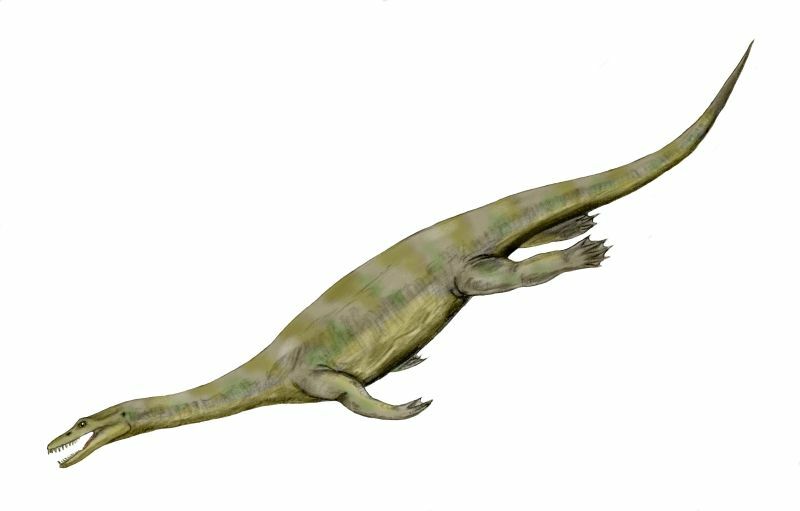 It is believed that Nothosaurus would have hunted in the shallow inshore waters but would have returned to land to rest and so as to avoid larger marine predators. Like the other marine reptiles of the time, Nothosaurus lacked gills so would have had to return to the waters surface in order to breath. This entry was posted in Triassic - Nothosaurs and tagged dinosaurs, nothosaurs, nothosaurus, prehistoric, triassic. Bookmark the permalink. Great site. Will you be covering Triassic archosaurs? Personally, I find the Rauisuchians and Phytosaurs particularly fascinating. Hi there, thank you for your comment. I will definitely be covering some of the Triassic archosaurs. I will get through all the marine reptiles first… still a long way to go before I start writing about dinosaurs.